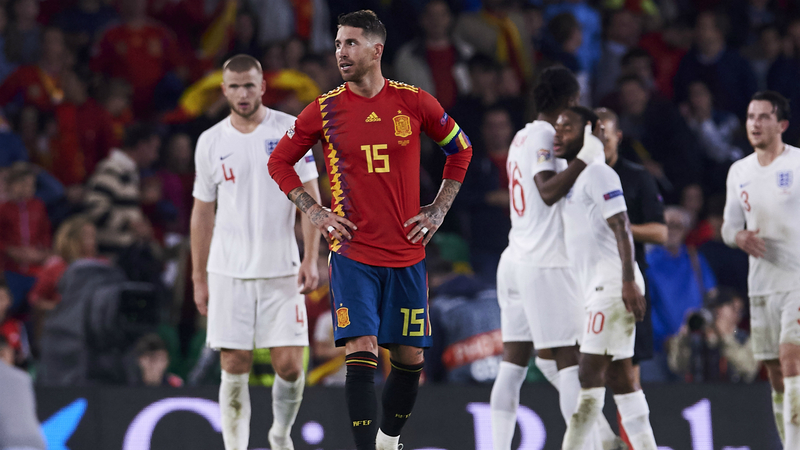 Sergio Ramos hopes the country can believe in Spain following their 3-2 Nations League loss at home to England on Monday. Spain lost a competitive home fixture for the first time since 2003 – ending a run of 38 matches without defeat – after being upstaged by World Cup semi-finalists England in Seville. England scored three unanswered goals in a stunning first half before surviving a second-half onslaught – Paco Alcacer and captain Ramos reducing the deficit for Spain. It was Spain's first loss at home to England since 1987, ending Luis Enrique's undefeated start after his appointment in July. Reflecting on the defeat, Ramos – who scored in the 97th minute – told Teledeporte – "England are a world-class opponent and they have very dangerous players. "We had as many minutes to score three goals as they had and the positive thing was the reaction of the team. "The beauty of football is that it gives us the opportunity to turn things around. We forgot the first half and, in the end, the positive is our reaction. "I have to thank this city, which is great to play in, and they leave you in awe so it is a shame we couldn't respond for them. I hope people can believe in this group." It was a night to forget for Spain, who trailed 3-0 at half-time following Raheem Sterling's brace and Marcus Rashford's strike. Spain and Real Madrid midfielder Dani Ceballos came off the bench before the hour-mark and impressed in a losing side. "The first half was a bit of a disaster and it left us in a bad position," he said. "The coach asked us to be ourselves, as we have been in previous matches, but we couldn't."